We left Opua in convoy. We were loaded to the gunnels and Starcharger were carrying Lorna and George of Quatsino. Our first stop was at a batch beside the sea at Kaimaumau. As an explanation, many New Zealanders have a family holiday home, handed down through the generations. often by the sea. It is known as a batch. These days they are less popular as international travel becomes cheap enough for most to run up to Fiji, Tonga or Aus for holidays. However, many are available to rent, they don’t cost a great deal and most are built in beautiful and quiet spaces. We based ourselves there for three days and had a great time. 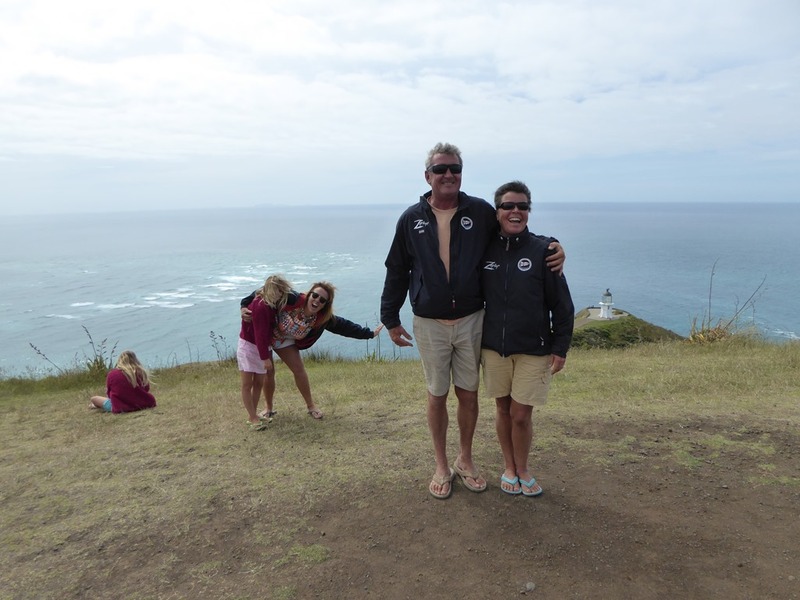 Day one saw us travel the final 80km to the northern most point of New Zealand – Cape Reinga. 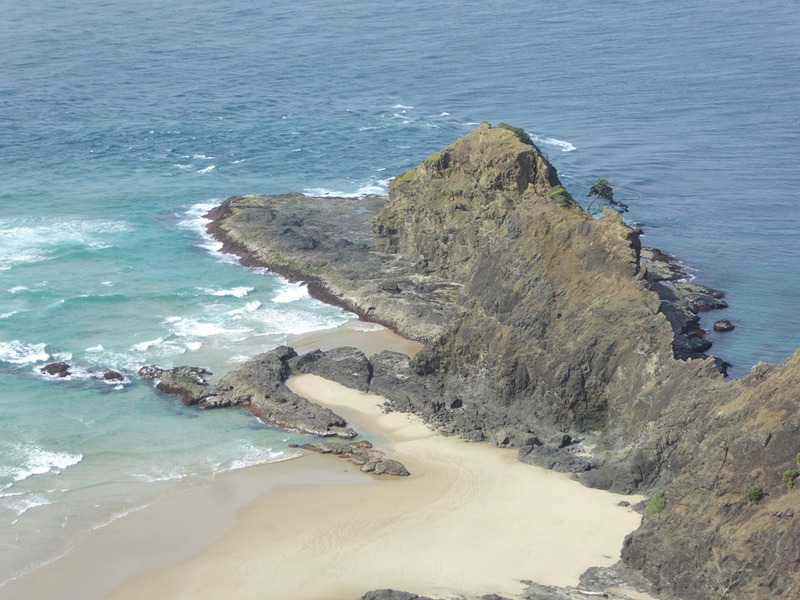 This is an important Mouri site as it is said that departing souls from the island travel to the Cape and lower themselves into the underworld, by way of the ancient Pohutukawa tree on the end of the rock outcrop, just to the W of the lighthouse. Day two took us to the wonderfully named 90 Mile Beach. It isn’t actually that long – it is only 80km – but the over exaggeration is forgiven. If you have a 4×4 veh, then the beach is open to you to drive on. With our poor beastie, we had to walk! 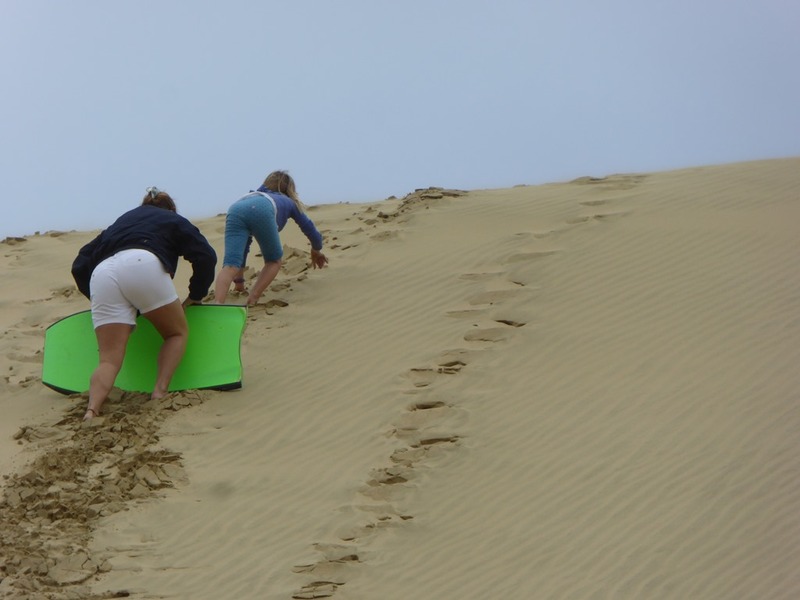 We had fun bouncing up and down some of the huge sand dunes and the view along the beach was an endless beauty. 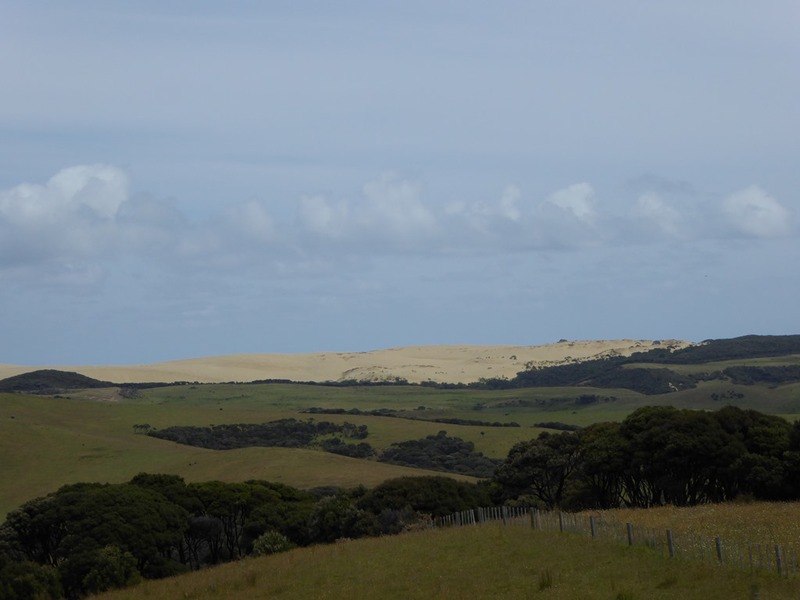 The day before when we were travelling up to the Cape we had been staggered to see hills of sand towering above the rolling grass downs of Northland. 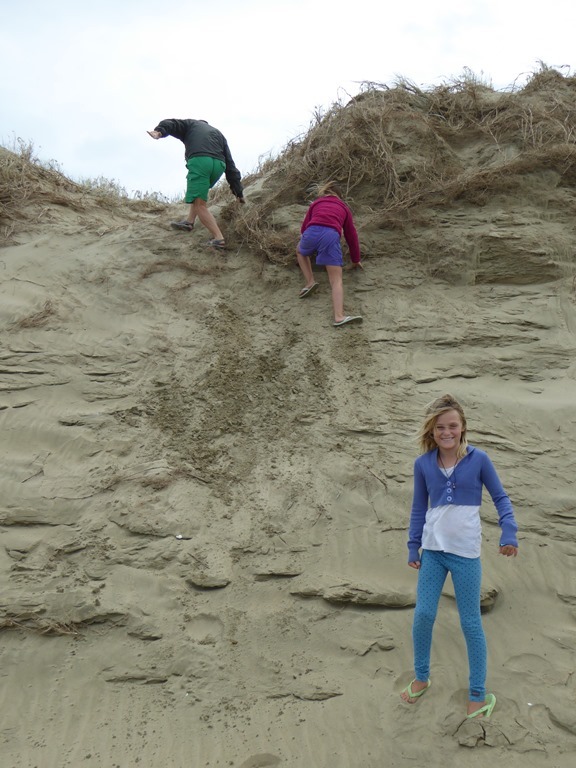 These enormous dunes have built up as sand is thrown ashore by the prevailing W wind and are common on the W coast running N from Auckland. We visited a baby one with Amelie when we were staying with the Hoburns. Standing hundreds of feet high, the ones near the North Cape are a different scale altogether. 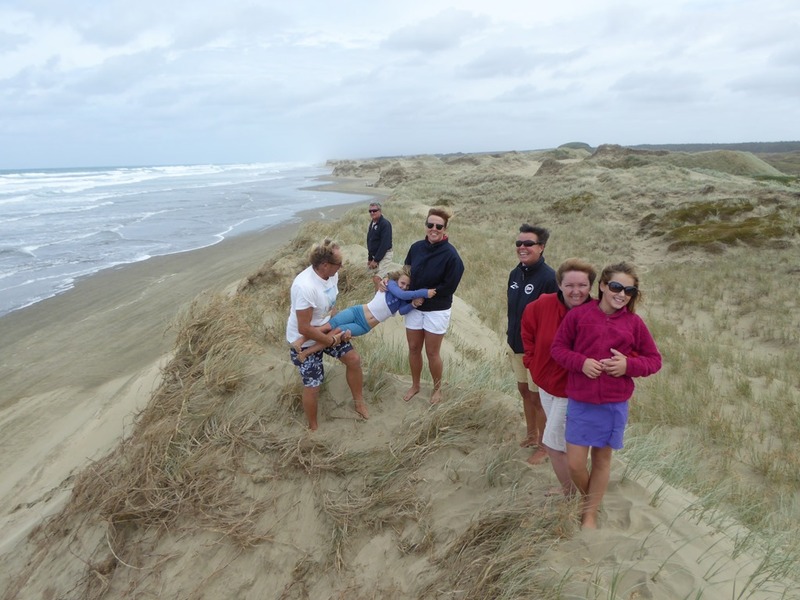 They have spawned another great sport – sand boarding. 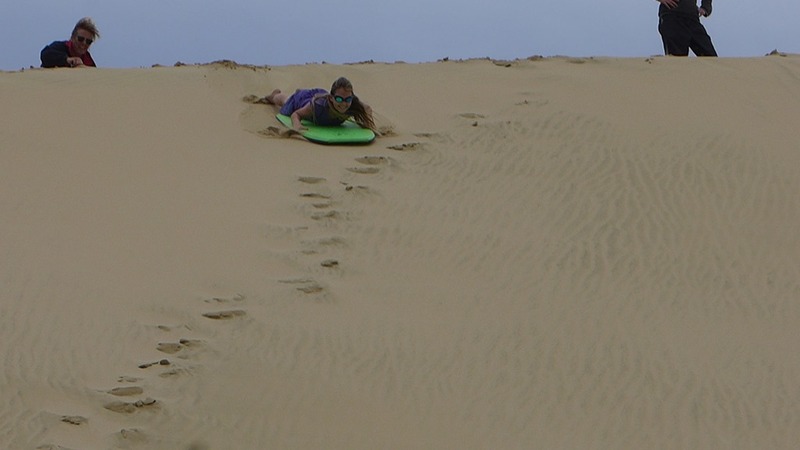 The only trouble with said boarding is the effort of climbing up a couple of hundred feet of sand dune. Climbing sand isn’t easy at the best of times. Do it a couple of times and your lungs are bursting and your legs are jelly. We got to the point of using relays to get the all important boards back to the top. The girls loved it. Alastair gave us the funniest descent, scattering the panicking watchers at the bottom of the hill with one of his banzai runs to everyone’s amusement. We left the company of Starcharger and Quatisino as they headed back towards their boats and we headed down the W coast by ourselves. We found that there was a ferry between Kohukohu and Rawene so rather than drive all the way back on to Highway 1, we took the recently graded W Coast Road which wound its way through the mountains. It was a great drive and the scenery was beautiful. The ferry took about half and hour. It was nice to be back on the water, even on just a stink boat! We stopped at the entrance to Kiapara Bay, the scene of a recent tragedy in November where a fishing boat was lost with eight deaths. The entrance to the bay is tricky with large sandbanks extending out over a mile. You can see two of them with breakers in the photo below. It is a beautiful harbour once you are in. Sadly the fishing boat touched one of the banks and turned turtle in the 4m breakers. There were only three survivors. We have been hugely impressed by the land management that we have seen throughout the North island. 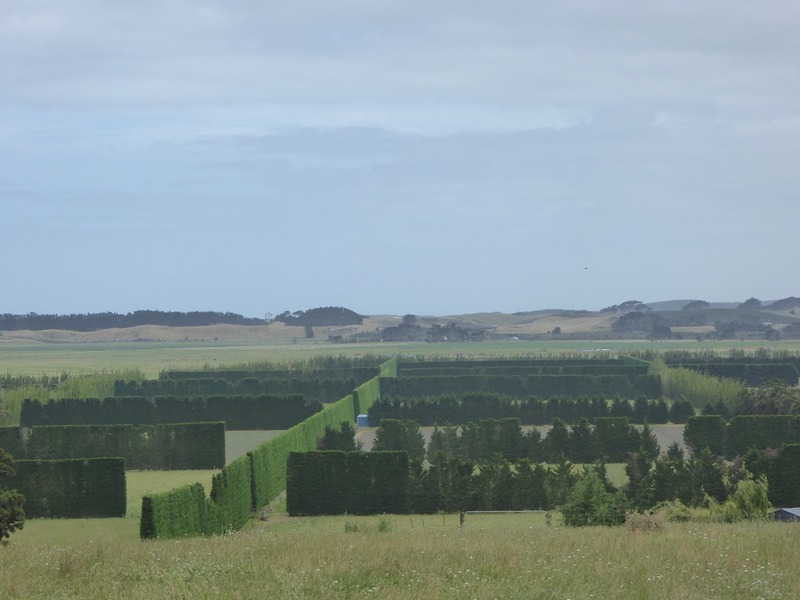 Where once the UK went down the initially efficient but environmentally damaging hedge removal, NZ farmers have built hedges and whole tree lines to divide land blocks, proving shelter for stock and crops. We spotted this area as we drove to the Kia Iwi Lake campsite. The norm around the vineyards, it is quite common to see them around just normal blocks of land used for livestock, as seen here. These tree lines are 40-50’ high. 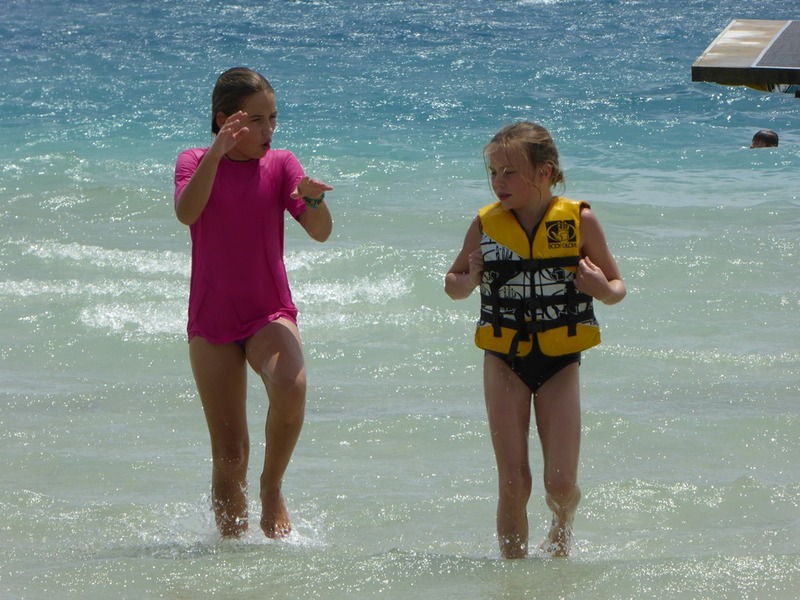 The Kia Iwi camp site was well set out and great fun. On a freshwater lake, it means endless splashing around for the kids in the surprisingly warm water and of course there were plenty of other smalls around to play with. 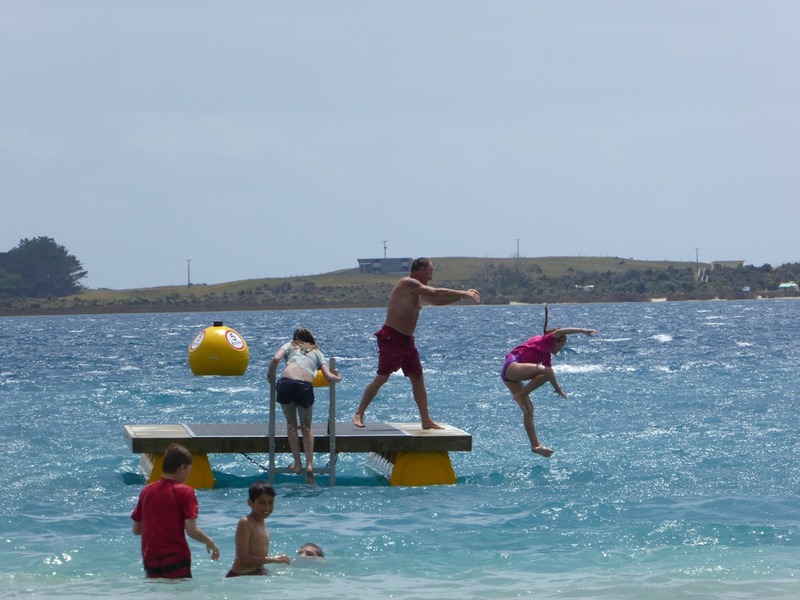 Dad got involved too and there was a certain amount of tomfoolery protecting the swimming platform! We also met a great couple, well into their eighties who have invited us to visit them on our return to Auckland. Ex RAF but an émigré more than 50years ago, he still hasn’t lost the accent! We stayed at the site for three days and left with tears. 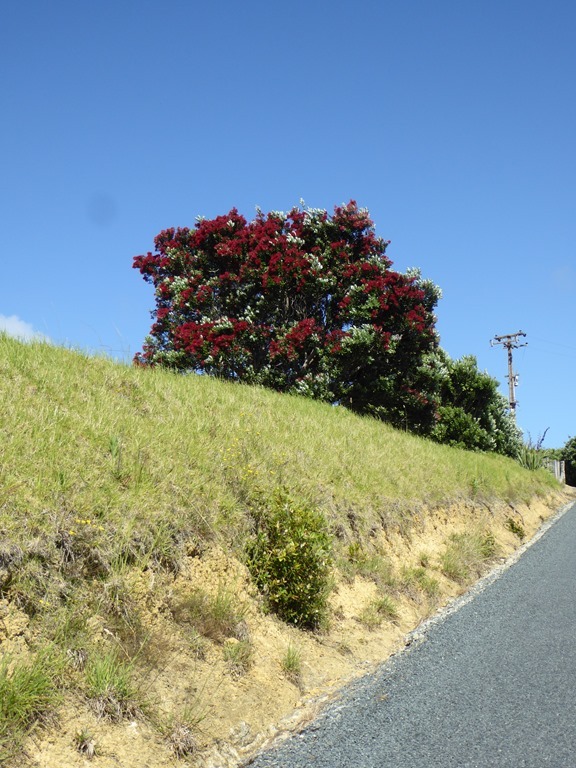 Heading South, we drove into the area of NZ that is the home of the giant Kauri trees. Once common across NZ, they were cut down in huge numbers in the 18th and 19th century for their hard wood. Now, very few are left, they are protected and NZ has started to replant them. It will take even longer than the UKs New Forest to grow back to glory as the trees grow slow and will last to over 3000years. We visited the largest of them left named Tane Mahuta, The Lord of the Forest, thought to be about 2000years old, said to be a baby in comparison to the monsters that were around a couple of hundred years ago. The other interesting fact around these trees is that they are the source of GUM, which once petrified becomes amber. A major industry of the 19thC was to collect the gum from the trees by scoring them or dredging up all the old amber that was plentiful in the swamps, melting it down and exporting it. Gum was sorted in to different grades and was used for make such stuff as jewellery, the first linoleum (providing the waterproofing) and gumboots. Want to know where that particular word for wellington boots came from? Look no further. Interestingly, the North British Rubber Company (now known as Hunter) based in Edinburgh was taking out adverts in the local papers asking folks not to buy the knockoff “gumboots” made here as far back as the 1870s! 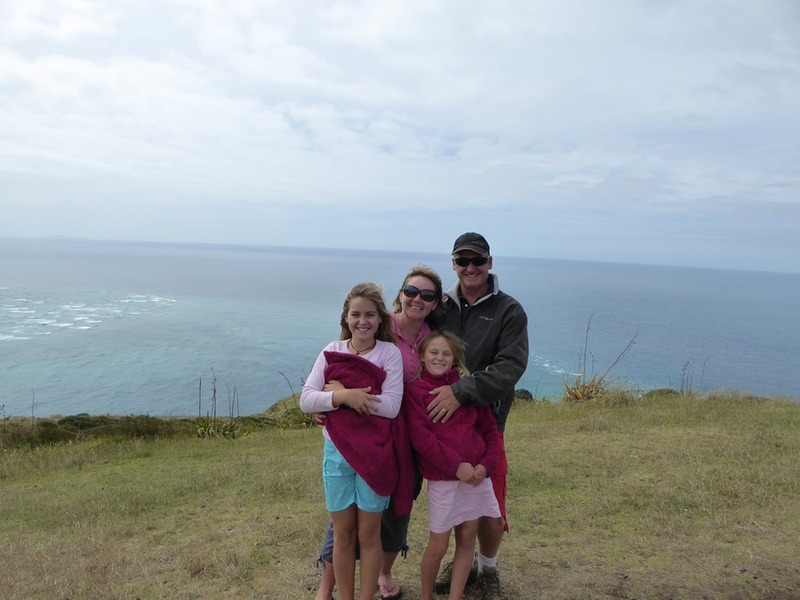 Our final stop before hitting Auckland again was at a campsite in the Tawharanui Peninsula Regional Park. The area is completely wired off to prevent stouts, rabbits and possums from getting in. It is a sanctuary for flightless birds and is one of the few sites with good numbers of kiwi. We didn’t see one although Eleanor says she heard one calling at night. We did see great numbers of Pukeka, another more common flightless bird. 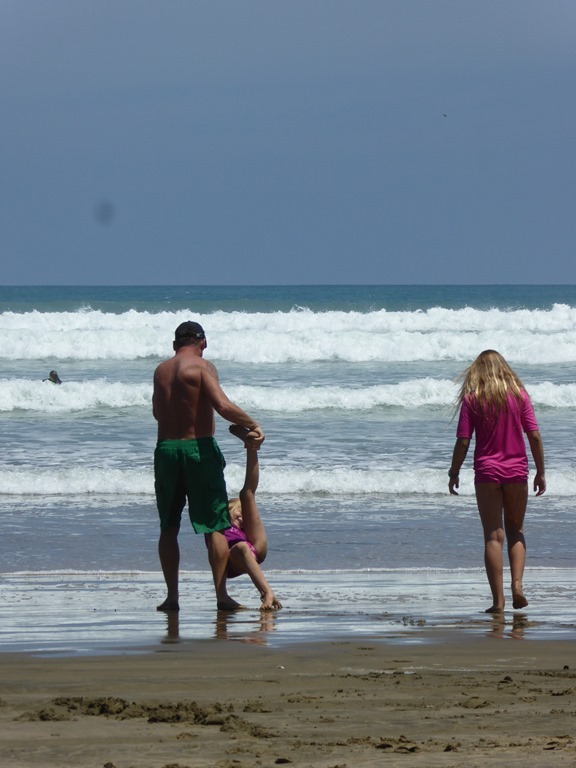 The beach was beautiful and and we saw lots of surfers returning to the camp happy after a day playing in the waves. We stopped in briefly to say hello at the Hoburn’s to pick up the left behind socks and Hannah’s Kindle. 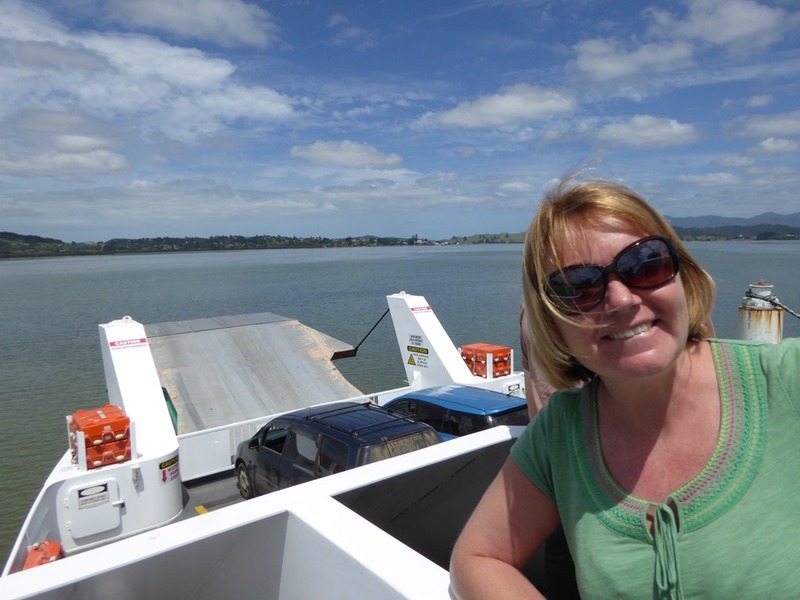 Then it was time to head into Auckland to meet up with Aislado and ZigZag for some Christmas celebrations. 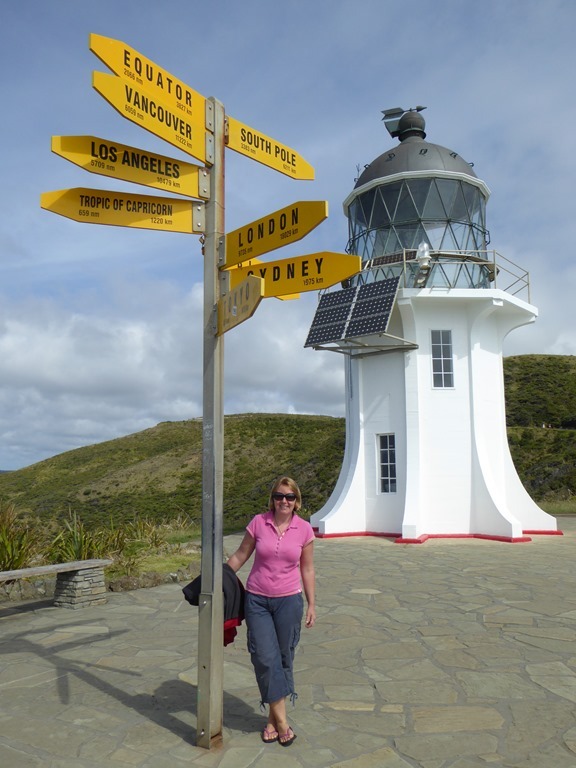 Northland is beautiful, warm and we have had great fun exploring it. As always, we wish we had more time to do it justice but what secrets we found, we have loved. Our thanks to Sarah and Mo for giving us so many hints and steers for our travels. Time to turn our sights on the wilder lands of the South Island.